Vijayaraghavan's Cricket Blog: WC.T.20. Day.8. Match.15. Australia vs India Gr.F. WC.T.20. Day.8. Match.15. Australia vs India Gr.F. 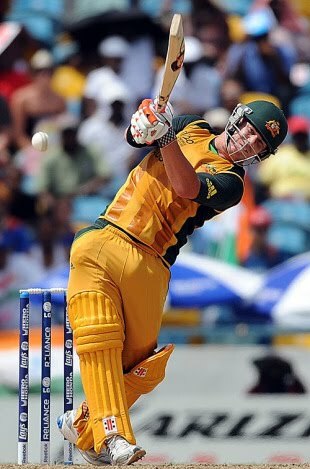 Australia 184 for 5 beat India 135 all out in 17.2 overs, by a massive margin of 49 runs. India just didn't know what hit them. It is also difficult to fathom the team selection. At Barbados, the pitch compared with Perth for its bounce and pace, India played with two pacemen and one spinner and other so called spinning all rounders. Other than Harbhajan and Nehra to an extent, all were clouted round the field. There were as many as sixteen sixes to six fours. The Aussies were not bothered about the field positions, since they were clearing the field every time. Lesser said about the Indian fielding the better. The batters could not bear the pace. Yuvraj, Vijay, Gambhir & Raina were found wanting to short pitched pacy deliveries, diverted at the rib cage. Australians were given a rousing start by Watson and Warner who put on 104 for the first wicket. Watson was the first to go for a well made 54 of 32. Warner 72 of 42 and David Hussey 35 of 22 played brilliantly and Australians were 166 for 3 in the 17th. When over 210 runs were anticipated, three brilliant overs by the Indians with Nehra's 20th being hit for just five, restricted the Australians to 184. Bajji 4.1.15.0 & Nehra 4.0.31.2 bowled well under the conditions. Jadeja 2.0.38.0 was taken to the cleaners. His last three deliveries of the first and first three deliveries of second were hit for sixes. Yusuf Pathan 4.0.35.1 and Yuvraj 2.0.20.2 were the other wicket takers. India was expected to do well with its famous batting line up. But the line up just remained on paper, and excepting for a excellent unbeaten 79 of 46 by Rohit and some lusty hitting by Bajji at the end, no one was able to stand up to Aussie pace. The Indian batting card was pathetic at Vijay-2, Gambhir-9. Raina-5, Yuvraj-1, Dhoni -2, Yusuf-1, Jadeja-4, what more can you ask for. Nannes 4.0.25.3, Tait 3.4.0.21.3, Watson, Johnson & Smith with a wicket each, bowled relentlessly, to reduce the Indians to 135 all out. Winning or losing is a part of the game. But when you lose without a fight and do not control the run rate which may come to play at a later stage, you need to be spanked for your effort. Nothing however should be taken away from a classic Aussie performance. they have come to WC.T.20 with a goal and appear to be on way to achieveing it.